The presentations have continued this week, and they have been a success! I have received positive feedback from classroom teachers who have seen the presentations done by the third graders. I am proud of each Green Team leader for planning and executing such informative presentations. Below is the link to the list of remaining presentations if you can see one. The grade level listed is the classroom where the presentation is being held. And now that summer is right around the corner, I have posted a list of summer enrichment ideas below in case you are looking for some extra activities to do. Week 8 Presentations have started! This week marked the beginning of the student-led presentations for the K-4 students. I was impressed by the two groups that presented this week and look forward to the future presentations. I will be sure to get some pictures during future presentations and post them. If you care to sit-in on one of the presentations, I posted the schedule on the 3rd grade main page. Also, a parent told me about an exciting opportunity coming up next week. Have you ever heard of the group Landfill Harmonic? There was a documentary made last year about the group. Visit the link here http://www.landfillharmonicmovie.com/ to watch the trailer. A group of people in Paraguay decided to make musical instruments out of trash from a neighboring dump. They then created an orchestra and perform around the world. ​The group, Landfill Harmonic, will be performing in Seattle on June 2nd (Mount St. Vincent, West Seattle) and June 3rd (Columbia City and Hearthstone, Seattle). Please visit the link http://www.elcentrodelaraza.org/landfill-harmonic-orchestra/ for specific times and locations. This week the students continued to work on their presentations. They are also busy collecting trash for their presentations to offer visuals to the classes about which types of garbage go in which bin. Some students will be showing these items while some are using them in a game format. I love seeing the creativity and collaboration among the groups! On Thursday, we had a representative from Recology CleanScapes visit the group and share important information about recycling and composting. (Recology CleanScapes is the business that collects St. Joseph's waste). Elizabeth, the outreach and education representative shared the 4Rs (instead of the 3RCs). Can you guess what the 4th R stands for? Be sure to ask your child! She shared pictures and videos about the process of sorting the recycling. We learned a lot of helpful information that can be used in the students' presentations. Elizabeth explained that the process of composting is like baking a cake. Great analogy! Be sure to ask your child to explain that analogy to you. -Each person creates about 5 pounds of waste per day. Plastic film including plastic bags. These get stuck around the machines and an employee has to crawl down and manually cut them out. You can tie up multiple plastic bags together and recycle them as a big clump - just don't do it separately! Importance of items being clean. Elizabeth told us you can "spoon clean" though. This means wiping containers down well with a utensil. Shredded paper. It flies everywhere in the facility and ends up in the landfill. Be sure to compost shredded paper! -You can compost colored, soiled napkins. -Seattle does not recycle by number. Any styrofoam container that has a number on the bottom and a recycling symbol is not actually recyclable. -Clean, shiny paper plates can go in the recycle. If they are quite dirty, they need to go in the garbage. (Any shiny layer on a paper item can't be composted. Starbucks coffee cups are a great example. They need to be recycled). We are grateful for Elizabeth's expertise. She plans to return to the school in the fall and share helpful reminders to start the school year off on the right foot with correct garbage sorting. This week the students learned with whom they will be working and the grade assignment for their presentations to the primary school. The groups and pairs used an outline to organize their information and then started planning what they will actually do and say for the presentation. Some groups are integrating games while others are using Power Point to teach the kids. I have been impressed by who well the students are thinking about their audience during the planning phase. I am excited to see the final products! Over the past several classes, the students compiled their data from the garbage analysis and then made lists of common items found in the cafeteria receptacles. This information will be used in the presentations for the students. This week, the students learned a bit about what makes a strong presentation. Be sure to ask them what they learned and perhaps their ideas for their presentation. Here are two links to videos we watched to gain a better understanding about what makes a strong presentation. Week 3 - Waste Not, Recycle Not and Garbage Analysis! This week the group read the Seattle Times op-ed "Waste not, recycle not" ("Preventing waste is a better solution than recycling it") and discussed the value in reducing waste. 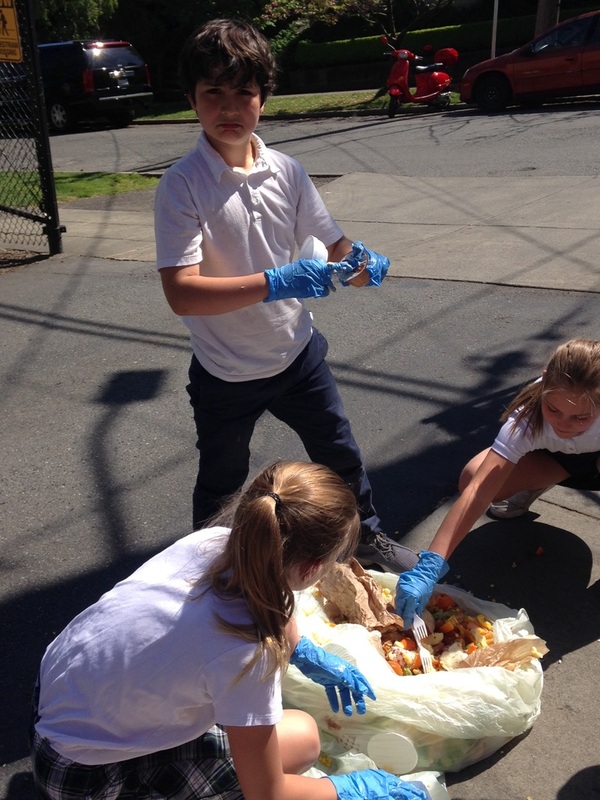 Later in the week, the students examined the garbages in the school cafeteria. One group was tasked with looking through the compost, another sorted the landfill, and a final group looked at the recycle. We discovered that the students generally know what to recycle and do recycle the correct items. The landfill bag and compost bag had many incorrectly disposed of items. We know we need to educate! So, it was pretty obvious that what the third grade students are doing in this unit will really benefit the students and environment. Below are several pictures from the kids' dirty but impactful job. This week, the students continued to explore the 3RCs by reading a Scholastic News article and watching a video from the Cedar Grove composting company. -food waste in the United States. Be sure to ask your child about what we learned this week. Next week, look for some returned assignments in your child's folder to see what we have been working on. On Thursday, the students were assigned to interview a friend, family member, or neighbor about the 3RCs. Students will bring their notes to class on Monday to share during class. Please see the assignment sheet below for more information. This week marks the beginning of the third session of ALO. 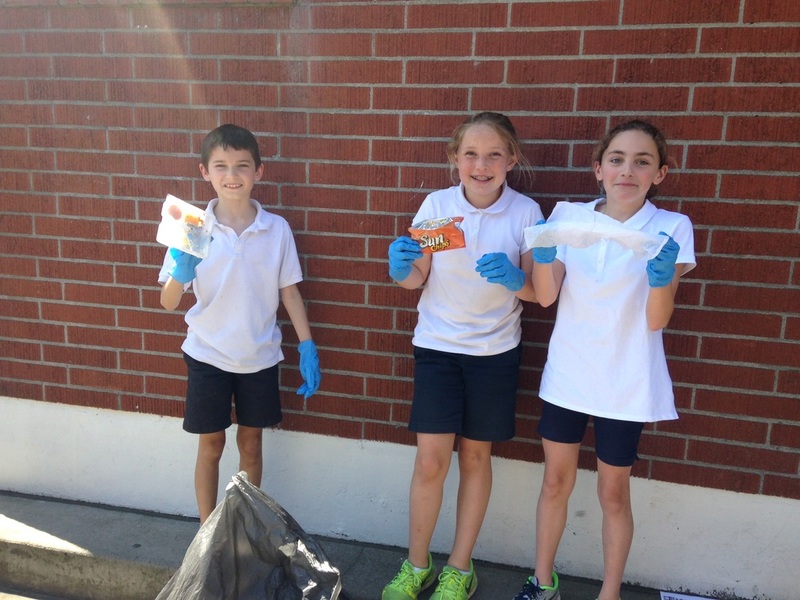 The third grade students will explore what it means to reduce, reuse, recycle and compost (3RCs). Then, the class will research what is currently happening in the school cafeteria with regards to the 3RCs. The end goal is to create a presentation for primary students that informs them about how to follow the 3RCs in the school cafeteria. How are students disposing of their trash at school? How can we improve the current trash situation in the school cafeteria? Why is it important to recycle and compost appropriate trash? The students' assignment this week is to keep a record of their trash during the school day on Tuesday, Wednesday, and Thursday. They are writing down what they throw in the garbage, compost, and recycle. We will share our findings in class on Thursday. This week, the students have been working on putting together their booklets. They are creating the pages and will be binding them up so all their hard work stays together! Next Monday, the students will be sharing their stories. We invite families and friends to be a part of this celebration. The time is 2 PM with a location to be determined. I am working on securing a larger space than the current ALO room. Look for an email from me. Next week is the last week of classes for this ALO session. The teachers and I are currently meeting and discussing details for the next unit which will start after Easter break. More information and details to come.